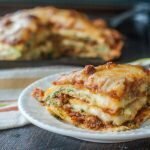 If you are craving lasagna on a low carb or gluten free diet, this low carb lasagna is the recipe for you. It's rich and savory and highly addicting at only 6.0g net carbs per serving. Heat up two non stick frying pans. Add cooking spray to both and In the small one, add a beaten egg and swirl around to make a crepe. Flip over into the other pan and finish cooking. Should only take a minute or so per side. Do this for 5 eggs to make crepes. In a sauce pan, brown the sausage after taking the casing off. Add in garlic and then marina sauce. Let cook through for a few minutes and then take off stove. In a bowl add the ricotta, 1 beaten egg and spinach. Mix well and set aside. Spray cooking spray all over a small springform pan. Add 1 crepe then top with 1/3 cup of meat sauce. Add next crepe and top with ricotta mixture then 1/3 cup of the mozzarella. Add one more layer of each and then top with remaining sauce and then remaining mozzarella. Bake for 30 minutes then let sit for 15 minutes before cutting. * I bought everything at Aldi. I used their Specialty Selected Marinara sauce and their Happy Farms Whole Milk Ricotta. Please check labels when choosing your ingredients to get the lowest carb brands that you can.